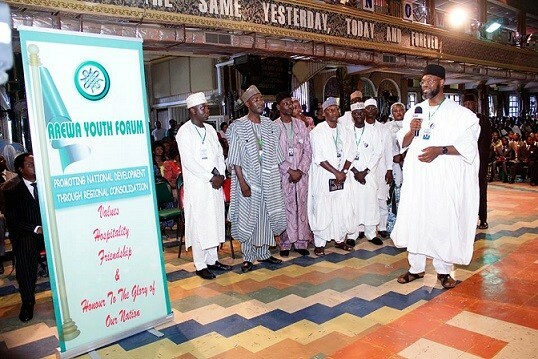 The Arewa Youth Forum were at the Synagogue Church Of All Nations to present Prophet T.B. Joshua with an Ambassador for Peace award. National Director of Public Affairs, Arewa Youth Forum, Benue, Nigeria, Bello Abdulhamid, said Joshua deserves the award because of love he has always demonstrated irrespective of barriers of race, religion, creed or ethnicity. Speaking on behalf of the northern states of Nigeria, he said that Kaduna, Yobe, Plateau, Kano and Jigawa States are all beneficiaries of the trailers of rice that Prophet T.B. Joshua sends. He said, “Prophet T.B. Joshua is a man with phenomenal vision. He shows a deep sense of compassion and unconditional love. Prophet T.B. Joshua is a blessing not only to us in Nigeria but also the international community. Prophet T.B. Joshua is the very first man of God that we are visiting and honouring. Our independent assessment has shown that The SCOAN has been committed to provide not only for the spiritual but also for the physical well-being of people”. “Fellow Nigerians, we are here because of the love we see in the life of Prophet T.B. Joshua. We need love to come together as a nation. Where there is love, there is no killing, stealing or destruction. Where there is love, there is no segregation. Love is the solution to our problems in Nigeria”. The National President of the Arewa Youth Forum, Ibrahim Gambo, said that they have picked T.B. Joshua as a leader to bring back the lost love in Nigeria. Isa Kurgui, the National Vice President, North-Central, Arewa Youth Forum said that in a society where there is love, you can sleep without locking your door, you can go anywhere without fear. He concluded by saying that from this day henceforth, Prophet T.B. Joshua is the Grand Patron of Northern Nigerian Youths. The congregation rose to their feet clapping as Prophet T.B. Joshua was presented with the award as Philanthropist Par Excellence Ambassador of Peace. Standing side by side with them, the Prophet explained to the world his reason for accepting this award during the live service. He said, “I will receive this award in order to join them to bring peace to some troubled spots in our nation, Nigeria”. for prayers and healings, all you need to do is to request for his anointing water. Prophet T.B he is a man of GOD ,May GOD always be with him. 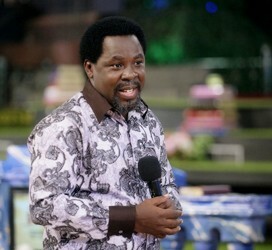 Prophet T.B Joshua,he is a true man of GOD, he deserve it. E ku ise Oluwa.